Tell us a little about why you selected these typefaces. There are many things I respond to in the fonts I selected. For starters, I love the typeface Joschmi. I am always a sucker for a well designed and easy to use stencil inspired font. Maybe it’s my early days of making gig posters and designing flyers on the Xerox machine, but the refinement and whimsy that Joschmi brings to the table is really appealing. I chose several of the other typefaces to pair well with Joschmi. Mongoose, Reross, Hatch, and CarlMarx all seem to complement Joschmi well. Many of these are typefaces I am currently using on a new brand identity system my team and I are working on. We are literally exploring with this set right now to determine the final family. The typeface from my list that I am loving to use at the moment is Acumin. The Variable Concept version that allows you to adjust custom weights is game changing. Last but not least is our studio’s favorite script, Viktor Script, designed by our good friend Erik Marinovich. This is truly unlike any other script out there. It is beautifully designed, modern, easy to read, and always adds the perfect punch to your design. Just like any design decision, select your typefaces with strategy, hierarchy, and a level of conceptual thinking. It can be easy to just start selecting typefaces that you visually respond to with no real strategy. Although that can sometimes work, we try to think about who our client is and what makes sense for the identity or message they wish to communicate. What does that client want to say with their new brand identity or packaging piece? If your client is modern, approachable, and clean, those are all attributes that can help you select the right typeface for the client and the project. From there, it’s about selecting the typefaces that help create hierarchy within your message. I would tell people new to typography to allow your interests outside of design influence your work. If you are into hiking and fly fishing, how can that influence the way you make marks? If you love sports, let that love influence the way you tell stories and build design. For example, Lexia Advertising is a big heavy slab typeface that surely was influenced by classic football letterman jackets of the 1950s. Let those extra interests influence your work, it will make you a better designer and much more interesting person. Tad Carpenter is a designer, illustrator, author, and educator based in Kansas City, Missouri. 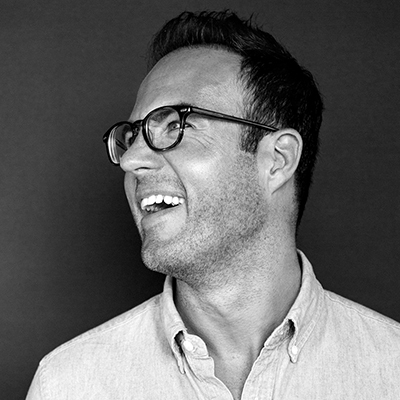 He co-runs the Carpenter Collective design and branding studio with his wife, Jessica Carpenter, where they focus on bringing powerful messages to life through branding, packaging, illustration, and design. Carpenter has also worked with numerous bands on posters and tour campaigns, and he has written and illustrated over twenty children’s books.